Young, good-natured Charlie wins one of five golden tickets hidden amongst thousands of Wonka chocolate bars. What have Charlie and the other four kids won? A tour through Willy Wonka's chocolate factory, led by the eccentric but often mean-spirited Wonka himself. The factory itself is like a fantasy world: crazy color schemes, wild inventions, secret rooms, busy elves, and lots and lots of delectable sweets. But Wonka has a hidden agenda, and during the tour he tests each child's character and honesty. 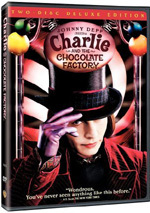 When it is clear that Charlie is the most trustworthy, kind-hearted and dependable kid, Wonka awards him with a gift that is every child's dream. Every once in a while I check out something that I remember - usually fondly - from my childhood. Prime examples include youthful faves The Towering Inferno and Jaws 2. Few go quite so far back as 1971's Willy Wonka and the Chocolate Factory. I saw this when I was exceedingly young - it arrived during my fourth year of existence - but I still remember it pretty well. I genuinely loved this film as a child, and I also adored the Roald Dahl book on which it was based, Charlie and the Chocolate Factory as well as its sequel, Charlie and the Great Glass Elevator). Hey, I even chowed down the Wonka brand candy - gotta love those Scrumdiddlyumptious bars! I always take on a risk when I check out a childhood favorite. With Wonka, if it turned out to be a dud, that meant yet another little piece of my past shot to bits. That's always the danger when you decide to see if something's as good as you remember. Not the same can be said for Peter Ostrum's exceptionally bland performance as Charlie. Emotionally, Ostrum possessed two modes: happy and sad. Unfortunately, his "happy" looked like "stunned" whereas his "sad" came across as "constipated." Ostrum's lack of range didn't really matter during the second half of the film - Charlie had little to do once they arrived in the factory - but it did hurt the first half, since I never actually cared if Charlie found the stupid winning ticket or not. Eat your cabbage soup and shut up, you pasty-faced little troll! The remainder of the supporting came across more strongly. Julie Dawn Cole offered what remains the definitive portrait of a true brat as that nasty piece of work called Veruca Salt. Obviously the filmmakers recognized the power of Salt since she was the only one of the bad kids to get her own song. Also good was Denise Nickerson as crass little Violet Beauregarde; sometimes she didn't seem quite nasty enough, but she still shined. I may receive flack for this, but the songs from the Oompa-Loompas were probably my least favorite aspect of the film. Okay, they're catchy tunes which will stick with you for pretty much forever, but I genuinely hated the scenes in which their songs were performed. To have the Oomps warble annoying little ditties that completely spell out the various morals seemed ridiculously redundant. I mean, it's not like Mike Teevee or Veruca Salt were subtle character studies; we picked up that they paid for their overindulgence without having some little people sing it to us. 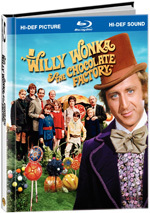 Willy Wonka and the Chocolate Factory appears in an aspect ratio of approximately 1.85:1 on this Blu-Ray Disc. Expect an appealing presentation here. For the most part, Wonka offered good definition. The source material sometimes could be a little soft, largely due to the photographic styles. This made some instances of lackluster definition inevitable, but the movie usually looked fine. Jagged edges and moiré effects created no concerns, and I noticed no edge enhancement. Source flaws were also essentially absent. Grain was a little heavy at times but not inappropriate, and otherwise, I saw a tiny speck or two but nothing more. Wonka featured a wonderfully vibrant and vivid palette, and the disc reproduced the tones with fine boldness and accuracy. From Wonka’s purple garb to red clothes worn by Violet and Charlie to the green hair and orange faces of the Oomps, colors always appeared fantastically bright and distinctive. They really leapt off the screen, and they added a lot to the movie. Black levels also seemed to be nicely deep and rich, and shadow detail usually looked appropriately heavy. A few shots were slightly thick, such as Charlie’s early visit outside the factory. That instance seemed to occur due to the use of day for night photography, and it still offered a clearer image than usual for that style of work. As a whole, the low-light situations were neatly visible and showed good balance. Ultimately, the image of Willy Wonka offered a fine visual experience. The disc’s Dolby TrueHD 5.1 mix took the movie’s original monaural stems and translated them into a modest but decent little soundfield. Much of the audio remained anchored to the center channel, and most effects usage seemed to feature modest ambience. On occasion, some discrete elements popped up in the side channels, but usually the effects seemed to stay with general atmosphere that lacked much delineation. On the other hand, music showed solid stereo separation, as the score and songs spread neatly across the forward spectrum. Audio quality occasionally showed its age, but overall I thought Wonka sounded good for a nearly 40-year-old film. Dialogue seemed slightly thick at times, and some lines betrayed mild edginess. However, most of the speech came across as reasonably natural and distinct, and I discerned no problems related to intelligibility. Effects were also a bit on the thin side, and they lacked great prominence. Nonetheless, they showed no signs of distortion or other flaws, and they represented their objects with acceptable accuracy. How did the picture and sound of this Blu-Ray compare with those of the 2001 Special Edition DVD? I thought the audio was a wash. The lossless audio didn’t get much of a boost due to the age of the source material, so don’t expect superior sonics. Visuals showed the standard improvements typical of Blu-ray, though I also found a not-unexpected drawback to the increased resolution: the film’s inherent softness became more obvious. Nonetheless, I thought the Blu-ray boasted greater clarity overall, and it offered a more satisfying rendition of the movie. 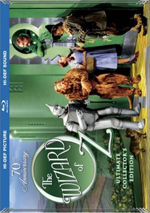 The Blu-ray includes most of the same supplements as the 2001 DVD plus one addition: a hardcover book. This comes as part of the package; open up the disc’s casing and the book appears on the left half. It features a mix of components. It presents notes about author Roald Dahl, bios of director Mel Stuart and actors Gene Wilder, Peter Ostrum and Jack Albertson, lyrics to six songs, thoughts about the story, and various photos. It’s a nice addition to the set. Next comes an audio commentary from all the “Wonka Kids”. We hear from all five of the movie’s main children, played by Peter Ostrum, Denise Nickerson, Michael Bollner, Julie Dawn Cole and Paris Themmen. They were recorded together for this running, screen-specific track. Whoever came up with the idea deserves a prize, for it’s a brilliant idea. The commentary can’t quite live up to the grandness of the concept, but it’s still a very fun and lively little experience. Also positive is a documentary called Pure Imagination: The Making of Willy Wonka and the Chocolate Factory. This 30-minute and 25-second program offers the usual combination of film clips, behind the scenes footage, and interview segments. All of the latter are new recordings, and we hear from director Mel Stuart, producer David L. Wolper, uncredited writer David Seltzer, and actors Gene Wilder, Peter Ostrum, Denise Nickerson, Michael Bollner, Paris Themmen, Julie Dawn Cole, and Rusty Goffe. As a whole, this show was a little brief, but it offered a fun and informative experience. 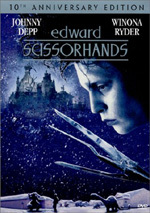 The footage from the set was crudely shot and generally not all that great, though the DVD had a few decent elements. All of it was silent except for the most compelling snippet. That one showed a demo of a Wonka song. Overall, I wish “Pure Imagination” had been longer and more detailed, but it still offered an entertaining and useful piece. In addition to the film’s trailer, we get Sing-Along Wonka Songs for four of the film’s tunes: “I’ve Got the Golden Ticket”, “Pure Imagination”, “I Want It Now” and “Oompa-Loompa-Doompa-De-Do”. These simply showed the film footage with highlighted text along the bottom of the screen. Since the DVD already included subtitles, this featured seemed to be a little pointless, but I suppose it didn’t hurt anything. At least it isolated the four tracks, and since they can be accessed together via the “Play All” option, you can easily create your own extended Wonka karaoke sequence. Does the Blu-ray lose anything from the 2001 DVD? Yes, but not much. It drops a photo gallery and some character biographies. Essentially the package’s book compensates for these, so they’re not a big loss. As a movie, Willy Wonka and the Chocolate Factory remains as fun and engaging as ever after almost 40 years. It’s one of the rare flicks that works equally well for adults and kids, and it holds up nicely through repeated viewings. In regard to the Blu-ray, it provides nice picture and audio along with some informative supplements. This is a fine release for a high-quality movie.